This family-run, 3-star hotel is located in the centre of Koblenz, just 500 metres from the train station and the banks of the River Rhine. Free Wi-Fi is available throughout. At the Hotel Hamm, you can look forward to comfortable rooms, all equipped with a radio and TV. A hairdryer is provided in each bathroom. Hamm’s rich breakfast buffet provides a great start to the day. There is also a cosy lobby bar on site, and a range of restaurants are within walking distance. A 10-minute walk brings you to Koblenz’s picturesque Old Town. Around 1 km away, sightseeing boats take you on trips along the Rhine and Moselle rivers. With a stay at GHOTEL hotel & living Koblenz, you'll be centrally located in Koblenz, within a 15-minute drive of Deutsches Eck and Rhein Mosel Halle Congress Center. This hotel is 0.8 mi (1.3 km) from Forum Confluentes and 0.9 mi (1.4 km) from Mittelrhein-Museum. Stay in one of 49 guestrooms featuring flat-screen televisions. Complimentary wireless Internet access keeps you connected, and satellite programming is available for your entertainment. Private bathrooms with bathtubs feature complimentary toiletries and hair dryers. Conveniences include phones, as well as desks and blackout drapes/curtains. 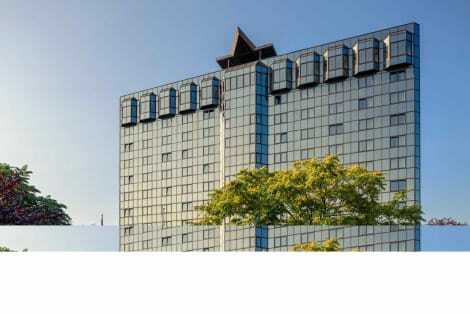 The 4-star Mercure Hotel Koblenz is located on the beautiful banks of the Rhine, close to the Rhein-Mosel-Halle and Electoral Palace and only around 0.6 miles (1 km) from the Deutsches Eck. In 2008, our hotel was completely renovated and modernized. All 168 rooms have free WIFI. The conference area, where events with up to 120 participants are held, also boasts the latest technology. Arrival: The main train station is only 0.6 miles (1 km) away. By car, take the A48 highway. lastminute.com has a fantastic range of hotels in Koblenz, with everything from cheap hotels to luxurious five star accommodation available. We like to live up to our last minute name so remember you can book any one of our excellent Koblenz hotels up until midnight and stay the same night.